Let’s face it, we all forget wrapping paper or don’t want to go the expense of purchasing yet another roll of ugly paper with a Bizarro world view of Santa and his reindeer. Here at FiscalGeek labs we’ve been working on some inventive ideas for covering your gifts. Notice I said covering, those may appeal especially to those who’ve never mastered the ancient art of paper folding. So whip out the spray glue and the duct tape we’re covering our presents. Alright you are diligent about shredding those nasty credit card offers and now you’ve got a can full of shredded paper what do you do? Cover your presents with it of course. Whip out your can of spray glue. I used Elmer’s Spray glue, but you could also use almost any of the 3M varieties or for a slightly more time consuming method you can brush on some Elmer’s White glue that you’ve diluted with water. Heck you could even dip the box in maple syrup pretty much anything that’s sticky will work. For the purposes of the instructions we’ll assume you’re using spray glue. 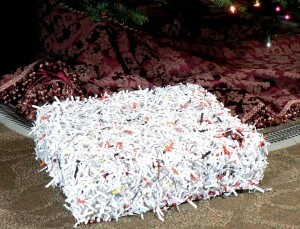 Amass your shredded paper and put it in a garbage sack or box larger than your present. Spray one side of your present with the glue and let set, typically about 15 seconds to tacky. Dip or cover the glued side in the shredded paper. Depending on your glue and coverage you may need to respray and do 2 coats. If you want to kick it up a notch you can shred some colored paper in there to give it some flare. If you are concerned about ruining the box that your present came in consider going the route of the Enigma Box and cover that. What better way to encase your heirloom quality breadboard you just built for your Mom than in the very wood shavings that gave their life for the present? The technique is identical to Shredded Awesomeness replacing your sawdust or chips with the shredded paper. This is a versatile technique that you can use with most anything around the house, corn flakes, dryer lint, dog hair, fireplace ash, the sky is the limit. This technique is also especially useful if you have to cover some odd shaped presents. The paper, sawdust or sand will stick all over. You could even use it to attach your traditional wrapping paper if you just can’t stand the hassle of using paper AND tape. There’s got to be an easier way! How about just tape? Are you tired of the unwrapping of Christmas morning lasting approximately 42 seconds as everyone unwraps their presents in a cavalcade of ripping and shredding? 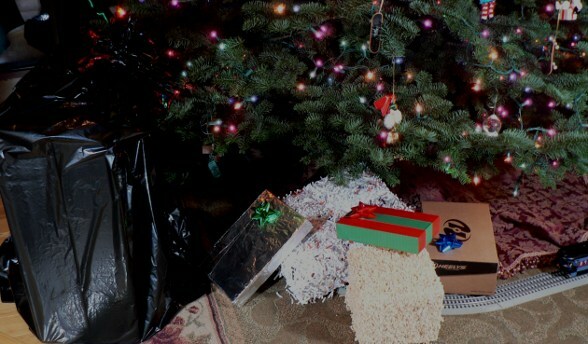 If you have covered their present in duct tape it will take them a minimum of five minutes to get that sucker unwrapped and that’s if they’ve got a pocket knife on them. As an added benefit their present will be air and water tight in case Uncle Eddy spills his glass of egg nog on the presents Christmas Eve. The technique is simple. Continue to cover the side placing one piece of tape over the next overlapping about 1/4″ each time. Once you have the sides done move to the top. Cut strips long enough to go around the entire box as you’ll be covering the top, bottom and ends with one wrap. 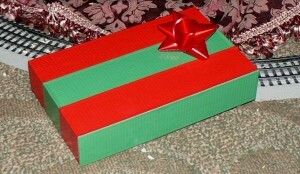 Continue wrapping around the box again overlapping 1/4″ each time. 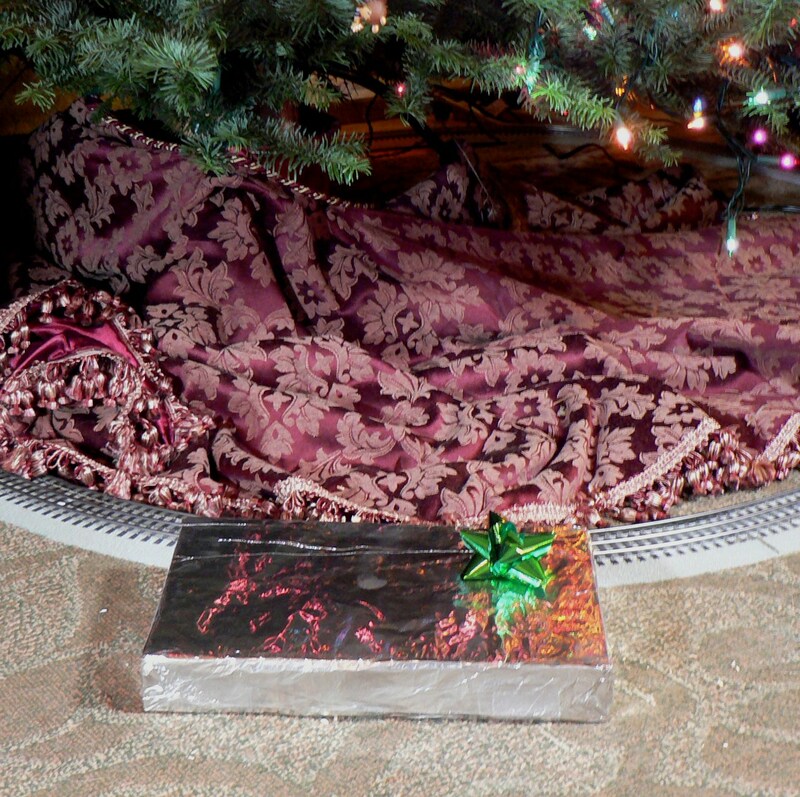 Marvel at the beauty that is your duct taped present. Now good old fashioned gray duct tape looks very nice, especially if you cut out some holly or reindeer out of a different color tape to stick on there. Or if you want to go full bore alternate green and red tape like I’ve done. Now that’s a gift that MacGyver would love. What’s that I see under the tree? Fifty pounds of Alaskan king crab legs? Aunt Fern knows I can’t eat shellfish. Oh but Aunt Fern is a trickster, she’s cleverly thrown you off the trail by placing her actual present inside a “donor” box. This works especially well if you want to hide some jewelry or other distinctive packaging that might give the identity of your gift away. You’ll note that I’ve hidden the present inside a Heelys box. No I don’t expect my grandmother wants wheeled skate shoes, but she’ll be beside herself when she open’s it up to reveal the book light I’ve purchased for her. Find a “donor” box larger than your present’s current packaging. Place your present inside the “donor” box. Laugh inside at your devilish cleverness. This technique is a good precursor to many of the other techniques if you are worried at all about damaging the packaging. This is a classic method that you might not have seen recently. I learned this technique from my grandparents as a child. If you don’t have enough paper, time or motivation this is the method for you. This is also a fantastic way to cover those items that are way to large for traditional wrapping methods and as a way to provide a convenient holder for all of the Christmas morning refuse. Get a garbage sack larger then the item you need to cover. Black or white are always nice choices. 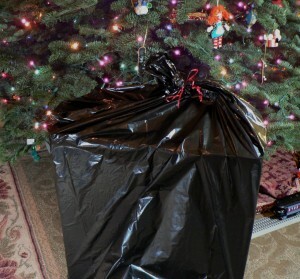 Put your present in the garbage sack. 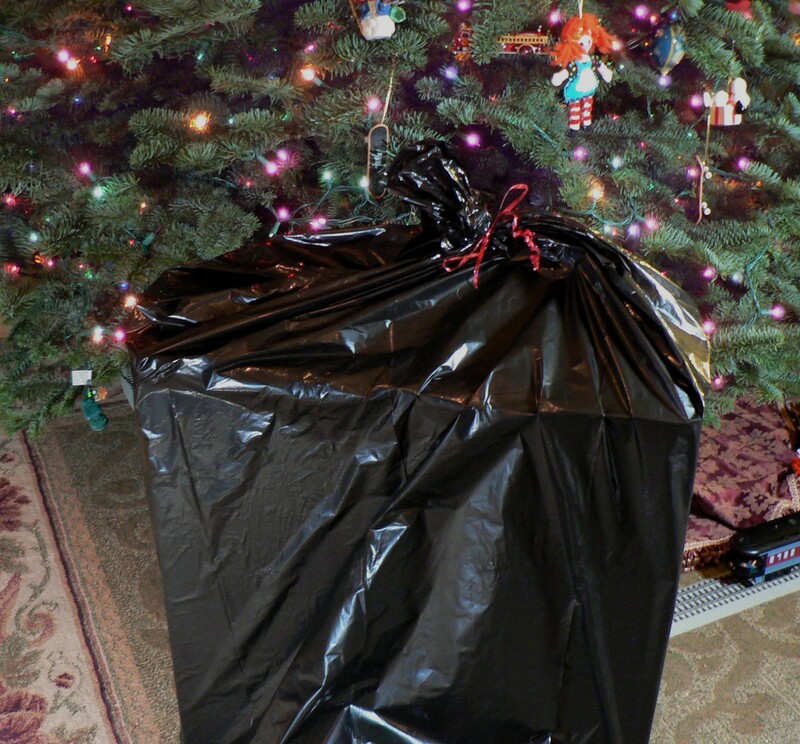 Tie the garbage bag closed with some string or for a real personalized holiday touch put some ribbon of a contrasting color on their with some nice ribbon curls. Throw the present over your back Santa you’re off to deliver the goods. This method is simple and not even worth detailing the steps. Get your present and some aluminum foil. Now wrap it as you would a regular present with traditional wrapping paper. As an added bonus you can choose either the shiny or matte silver finish depending on your mood. If you have a larger present you may want to choose an alternate method as taping several pieces of foil together can become tedious. What better way to wrap your baked goods then in an insulated package and you’ve killed two birds with one stone. Be forewarned if you put the present right next to some lights they get warm. Bow optional. My brother used to always wrap his presents using the Sunday Morning Comics. This is a classic method if you love to wrap. Why not tailor it to the person receiving the gift. Bob loves golf so cover his with a section of the sports pages. Or maybe you could cover it with the Best Buy ad so they can look at all the electronics they wish they had gotten for Christmas. Any way you look at it, your loved ones are going to love the fact that you’ve done something different and cared enough to come up with your own method. Got some of your own methods to share we are always on the lookout for new and innovative ideas. Money Hacks Carnival #96, December 23rd, 2009 "“ The Holiday Edition. Lol, great post. 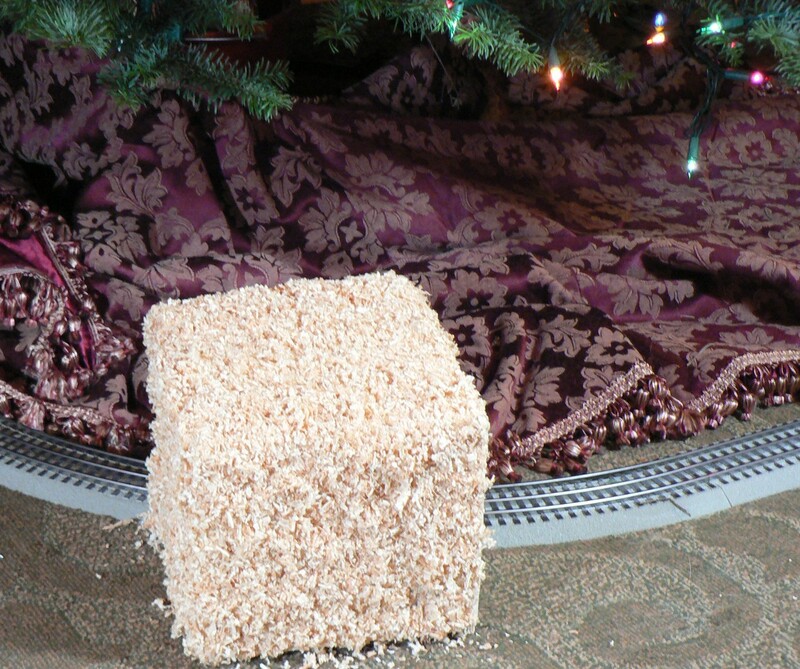 I bet the shredded/sawdust ones are a bit messy on Christmas morning. I wish I saw this before I wrapped my gifts yesterday. My sister likes to fill her Christmas cards with a bunch of fake snow flakes so they fall all over the place when you open it. The sawdust would be the perfect payback. .-= Derek´s last blog ..20 Tips to Save Money During the Holidays =-. Some of the best wrapping not only uses unconventional wrappings, but creates “characters” out of the packages. One year, we added eyes, hands, even tails to many packages. I recall using toilet paper rolls and bottle caps. It was a lot of fun. I was reading this comment on my iPhone and just saw the part about the tail and was grossing out a bit, but once I got the full gist sounds like a much better and fun idea. Thanks David. Great post! i love the shredded paper wrapping! I may have to try that one – even if it is a little messy! Yeah full disclaimer it does “shed” a bit. .-= Patrick´s last blog ..Savvy Money Tips from Cash Money Life Readers =-. I would also add newspaper. My mom always wraps gifts with comics from old newspapers. .-= Craig´s last blog ..10 Ways to Prepare Financially If You Suspect You’ll Be Laid Off =-. I am a big fan of using all of the scraps from everyone else’s wrapping. Decoupage anyone? The best part about these ideas, Paul, is that I don’t have to embarrass myself anymore with my wrapping, um, “prowess.” I’m the only guy I know who sometimes manages to insult his gift recipients because of my abominable wrapping jobs. Very sad. A blind man would be insulted by my gift wraps. Here is another idea: Old Pringle’s cans. I’ve actually used them before. Of course, stupid me also wrapped the cans – thereby ticking off my sister in the process. .-= Len Penzo´s last blog ..A Peek at My Kids’ 2009 Christmas Lists =-. I’ve done the donor box before with a box that is vastly larger than the actual present. It’s particularly funny when the recipient KNOWS that they are going to receive a particular gift. Wrap my gifts in comics, please! Especially if you subscribe to a newspaper that gets comics that I don’t get. .-= The Casual Observer´s last blog ..Mac vs. Windows =-.